Providing structural support for drivable grass driveways, parking lots and roads. NDS grass pavers are built to withstand heavy vehicular traffic. With strengths up to 98,770 psf, NDS these pavers are well suited for both grass roads where heavy vehicles will travel frequently, as well as driveways and parking lots where vehicles may be parked for long periods of time. Installation is designed to be easily accomplished by either a homeowner or landscape professional. NDS pavers are available in either roll or panel form, both of which can be attached to create a continuous surface of unlimited area. Grass pavers by NDS are compatible with both sod or seed grass installation. First, soil is placed in the cell membranes than seed is planted in the soil. 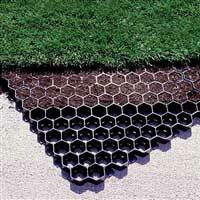 If sod is desired, it can be simply laid over the soil filled membranes on top of the pavers. With a variety of different applications, grass pavers allow for grassy areas to support constant vehicular traffic or parking without causing damage or rutting to the grass. The paver products are recommended for use in the following application types: fire lanes, event parking and overflow stadium, church parking, grass green driveway, utility access, on-street parking, pedestrians’ walkways, handicap parking, emergency access, infiltration basin reinforcement, golf cart paths, helicopter landing pads, airplane transport areas, service roads, roadway shoulder and equipment. It is also ideal for yards, truck maintenance, access road for emergency vehicle, overflow parking lots, jogging tracks, service roads, residential driveways, bike paths and the construction entrance of soil stabilization. Furthermore, this load application is also effective solution for swales and erosion control of slopes. Grass pavers as well as gravel pavers allow for instant rainfall permeability and can help reduce or eliminate the need for onsite drainage ponds which routinely cost developers thousands and are required when large paved areas are installed on properties in many regions. Perfect for the homeowner as well, these pavers are frequently used to widen driveways in residential settings for parking of an extra car or boat. Three square 2' x 2' pavers connected together. Square panel pavers are an ideal solution where the application calls for a paver which can withstand very heavy vehicles such as fire engines and semi trucks driving / parking over the reinforced area. Applications such as fire lanes or road shoulders often require the strength of these reinforced pavers to meet code and daily use requirements. The square pavers are available in 19” x 19” squares or in 24” x 24” squares and interlock together to create a continuous surface. These pavers typically are 1-1/2” thick and can support approx. 97,000 pounds per square foot of pressure when empty. Once the pavers are filled they can withstand much more weight. In smaller quantities the square pavers are shipped via UPS, in larger orders the material typically ships via freight truck. Installation of these pavers is fairly straight forward. A gravel sub base is applied to the site to provide stability. Next the gravel is compacted and a few inches of soil is placed above the gravel base. On top of the soil, the pavers are interlocked and placed. Once the pavers are placed the cells are filled with soil and seeded. 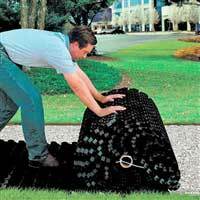 If sod is to be applied it is rolled directly on top of the soil filled pavers. It is important that during the first growing season the area is watered more than usual to encourage strong grass growth. The rolled pavers can withstand approximately 57,000 pounds per square foot of pressure empty which greatly increases when the material is filled with soil. These pavers are ideal for installation types where there will not be large vehicles such as semi trucks for fire engines driving on the material. Installation is a simple, straightforward process with rolled pavers. First, a gravel sub-base needs to be installed and compacted. This gravel base should consist of class 2 road base (3/4” crushed gravel) and compacted. 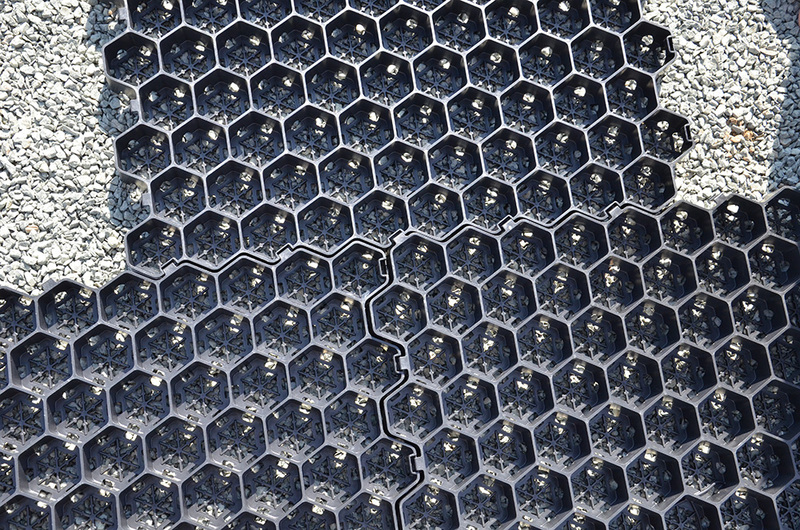 The depth of the sub-base varies by application. See the specific product description for recommendations on the exact depth of the sub-base required. Once the sub-base is established, the material can be rolled directly on the base. Next, the cells are filled with soil and seeded. Optionally, sod can be rolled on top of the pavers. The grass roots will grow into the soil in the pavers and anchor into the gravel providing a reinforced and beautiful grass surface. It is important to irrigate the newly planted area heavily the first year to help establish a deep root zone for the grass. Grass pavers are an excellent way to beautify an area which would otherwise be covered in cement, aid in stormwater management and avoid the costs and land devotion of drainage ditches. They are easy to install and are built to hold their strength with regular use. In either rolled or square form, the pavers are an excellent choice for both large and small projects in a variety of different installation settings. If you have any questions about our paver products, sizing, installation information or requests for volume quotes please feel to contact us at (800) 524-4161.